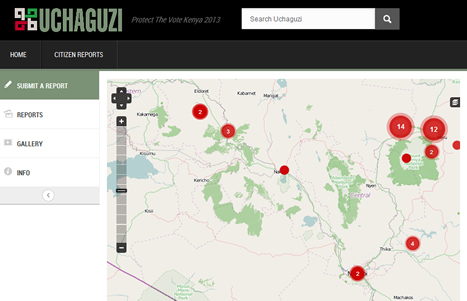 A new mapping platform to monitor Kenyan elections 2013 has been launched .Uchaguzi is a joint initiative between Ushahidi, Hivos, Creco, Umati, and SODNET, seeking to deliver unprecedented collaboration between election observers and citizen’s to monitor the March 4 general elections in near-real time. The goal is to extend the common practice of traditional election observation by seeking to engage citizens in election monitoring as citizens can be a valuable source of information for election observers to verify and amplify to the respective electoral authorities or security personnel in case of violence. The main of the platform is to help Kenya conduct a free, fair and peaceful and credible general election. After the chaos which followed the 2007 Kenyan general elections, this time it seems many organizations are prepared to preach peace and ensure that the same do not occur again. Uchaguzi brings in a unique collaboration process, involving the verification and deployments. Technology is only 10% of the story. Great to see that there are Android and iPhone apps.